Does Gastric Bypass Improve Serum Creatinine Levels? Background: Obesity has been associated with decreased renal function and chronic kidney disease independent of diabetes and hypertension. 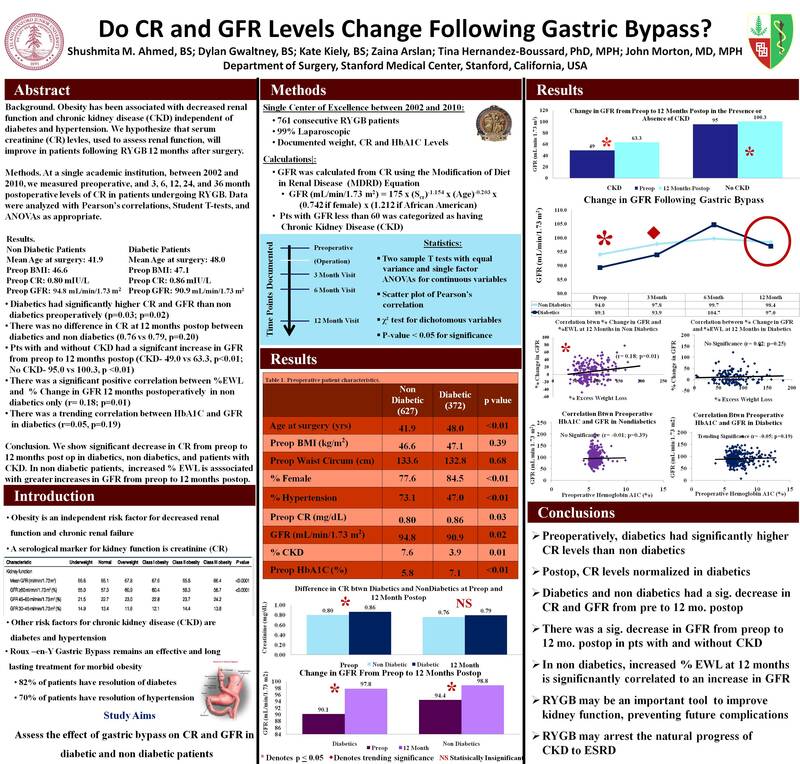 We hypothesize that serum creatinine (Cr) levels will improve in patients following laparoscopic Roux en Y Gastric Bypass (LRYGB). Methods: At a single academic institution, between 2002 and 2010, we measured preoperative, and 3, 6, 12, 24, and 36 month postoperative levels of Cr in patients undergoing RYGB. Data were analyzed with Pearson’s correlations, Student T-tests, and ANOVAs as appropriate. Results: Preoperatively, mean age of 962 patients was 44.1 years; the mean body mass index was 46.7 kg/m²; 82% were women; 37 % were diabetic; 56% were hypertensive; mean systolic and diastolic pressures were 140 and 77, respectively; mean Cr was 0.815 mg/dL; and mean hemoglobin A1C (hA1C) was 6.3%. A significant difference existed between preoperative and 12 month systolic and diastolic blood pressures (141 vs 128, p<0.001; 74.8 vs. 72.3, p<0.001). A significant difference in Cr levels between diabetics and non diabetics existed only preoperatively (0.836 vs. 0.802, p=0.016). A significant difference in hA1C levels between non-diabetics and diabetics existed respectively pre and 12 month postoperatively (5.820 vs. 7.083, p<0.001; 5.452 vs. 5.76, p<0.001). There was significant improvement in Cr from 0 to 12 months for non diabetics (0.789 vs. 0.756, p<0.001). In diabetics, there was only significant difference in Cr from 0 to 12 months in patients with resolved or improved diabetes respectively at 12 months postoperatively (0.822 vs. 0.782, p=0.041; 0.859 vs. 0.777, p<.01). Significant negative correlations existed between percent excess weight loss (%EWL) and Cr levels at both 6 and 12 months (r= -0.076, p=0.043 and r= -0.116, p=0.018). A significant correlation only existed between systolic blood pressure and Cr preoperatively (r=0.0858, p=0.013). Conclusion: Our study shows that RYGB significantly reduces Cr from 0 to 12 months in non diabetics and in diabetics with resolved or improved diabetes at 12 months, indicating an improvement in renal function after surgery. There is evidence that those with greater %EWL will have lower Cr levels at 6 and 12 months after surgery.